Yummy veggie dish bookmarked for my weekly veg day :) thanks for sharing ! enteyum fav aanu.. I have the same in my drafts.. Shall post it soon..
Curry looks so wonderful !! love to have with chapati's !! Hot & spicy mushroom compliments the white rice perfectly!!! 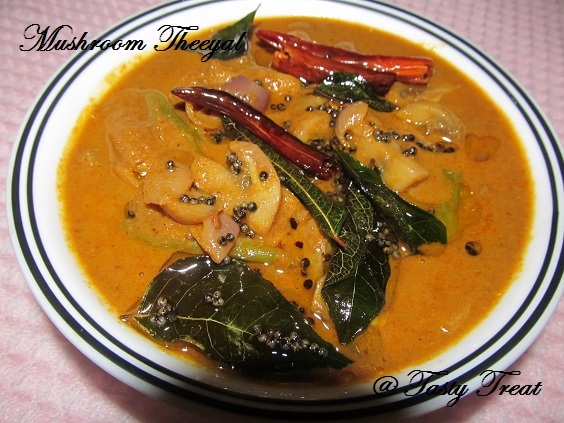 Lovely looking mushroom curry. Excellent preparation. that will make a delicious maincourse with some rice; looks tangy and appetizing!! looks extremely delicious..i like all types of different theeyals..great recipe.. This sounds simply wonderful ~ what a great blend of spices ~ YUM! 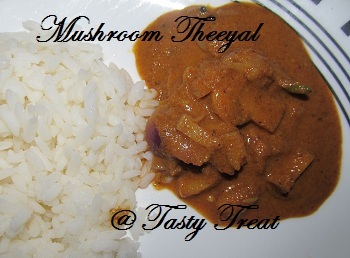 Mushroom theeyal sounds interesting. Good one Julie.. Mouth watering recipe. Looks delicious and tempting. Hi Julie, thanks for visiting my blog. 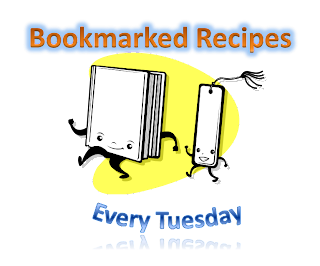 I love curry and roti and your blog has a collection of so many different recipes that I would like to try. I'm your follower and invite you to follow me, too.